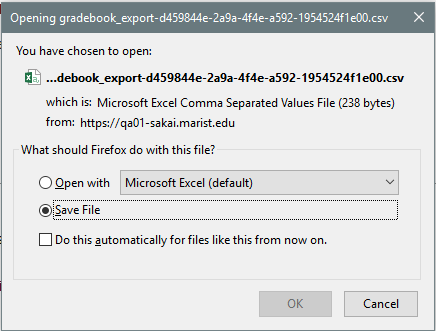 Sakai Guides and DocumentationSakai Complete User Guide GradebookHow do I format my file for importing grades into Gradebook? 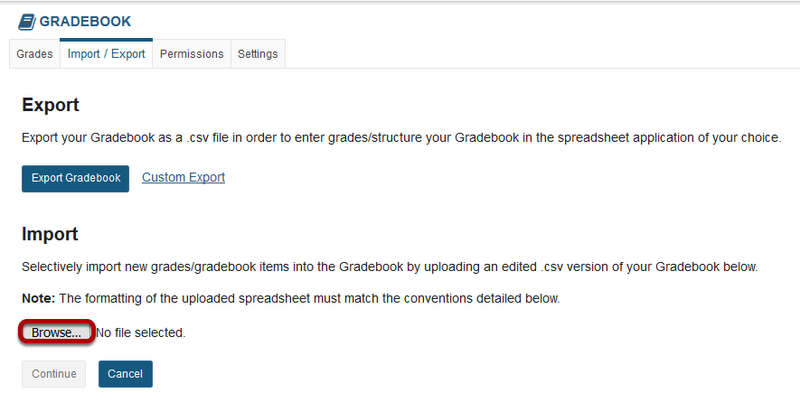 Instructors can manage grades offline in a spreadsheet and then import the file to update the course Gradebook. You can also import a file as a method for quickly creating several gradebook items at once. 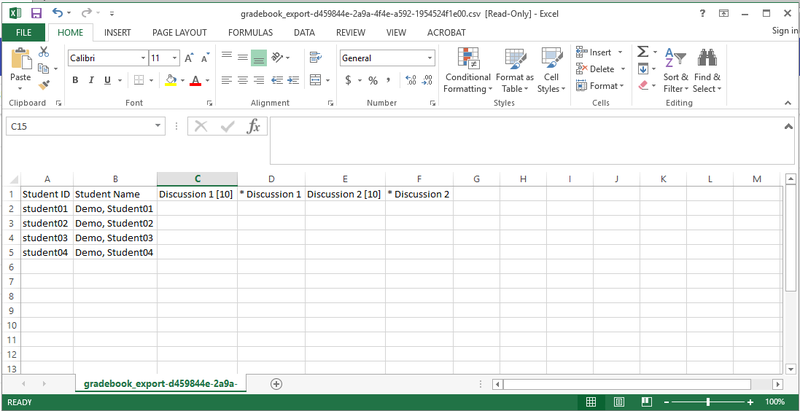 The easiest way to obtain a file in the proper import format is to export your Gradebook and use that file as a template. This way it will contain all of the student information in your site, as well as any existing gradebook item information in your site. Note: You can only update graded items that have been created within the Gradebook. Graded items that come from other tools, such as Assignments or Tests & Quizzes, cannot be updated via file import. The export will download as a .csv file. Open the file in your preferred spreadsheet application. 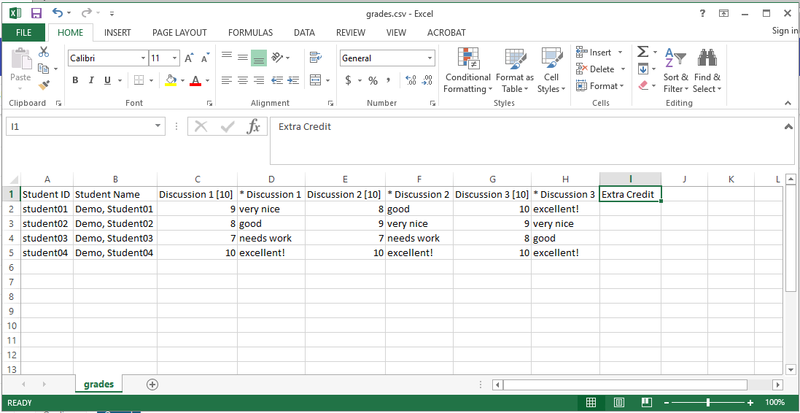 Add columns, grades, and/or feedback as needed, and save your file. Student ID and Student Name are the first two columns and must be retained for any future imports. Gradebook Items/Assignments may include points by wrapping the points in [ ] after the title, e.g. "Assignment 1 ". Comments can be imported by prefixing the column with a *, e.g. "* Assignment 1". Columns that cannot be re-imported are prefixed with #. Note: You may add new items to the gradebook by including new columns in your file. If you add any new columns without a point value in brackets, Sakai will prompt you to indicated the number of points upon import. Return to Gradebook > Import/Export to browse for and select your import file. For more information on importing your items into Gradebook, see How do I import grades into Gradebook? Prev: How do I export grades from Gradebook? Next: How do I import grades into Gradebook?